The husky I take such delight in riding with made a reappearance yesterday! In spite of the many significant milestones passed on August 31st, my mood was still strained with worry about Loke’s sluggishness even over an area he delighted in charging through just at the beginning of the year. Most of this return was due to Jens’ almost vehement encouragement to try Loke somewhere completely new to see how much of his apathy has been due to boredom. So, I plotted a loop of about 21 miles. It was in the Örsundsbro area again, but mostly along roads Loke’s not seen in quite some time and then only once. The drive over only served to deepen my worries. Firstly, Loke was acting very strange. He didn’t seem excited, but more stressed and uncomfortable. At one point, it looked as if he was having trouble sitting and might sick up. Add chill temps in the lower 50’s with brisk winds and drizzle which verged on the edge of rain at times. Yeah… not a good drive over. Jens kept reassuring me that he’d come get Loke at the drop of a hat if I called, or both of us if I got too cold. He’d even wait 10 or 15 minutes before leaving the church to be sure the fuzzy one wasn’t having problems from the beginning. Whatever had been bothering Loke in the car disappeared once he was trotting around Giresta Church with Jens. Trike assembled, I realized I’d not photographed the church. So, Jens had to wait another few minutes while I ran through the lychgate to find a good angle. The furry one actually seemed moderately excited once he was hitched up and I sat down. His tail wagged and he even vocalized a little. Not the full throated yodels of old, but certainly more than he’s done since Denmark. I loosed the brake and he leaped forward, powering for the road. My spirits took wing seeing such energy and eagerness. I tried to keep his speed down to about 12 – 13 mph rather than an full charge of 17+ mph. Trying to find a balance between such enthusiasm and minimizing impact to Loke’s joints can be a challenge at times. I did let him stretch his legs and move though. I pedaled briskly to help us along and ease additional strains on Loke as he loped along with that floppy tongued husky grin I love so much and haven’t seen in so long. At 52 F with stiff winds and lead gray skies, it was a doggie smile instead of jaws gaping for panting. Loke was reveling in the chill morning and unfamiliar landscape. A grin made my cheeks ache as the trike sped along and I ruffled Loke’s fur every few minutes. It was cold enough I had to stop to pull on my windbreaker, though thankfully no further spates of rain came along to dampen me or my spirits. Without a good layer of wool under my cycle clothes, getting wet would have spelled the end of the ride in those temps with that wind. I’m pretty sure the wind-chill was in the lower 40’s at least. Only about 2 miles along, the trike abruptly felt draggy and the sound of something rubbing in the back caught my attention. I found a place that let me get safely out of random traffic to examine the problem. The right pad on the rear parking brake was, for some reason, rubbing against the wheel rim. Annoying, particularly since fiddling with brakes requires laying on the ground with a recumbent trike. With a normal bike, one can just flip it upside down so it’s sitting on saddle and handlebars. Oddly, it never occurred to me to just end the ride and call Jens as I might have in the past. A sign of increased confidence in my trike mechanical abilities perhaps? I pulled off the jacket and set to work trying to figure out the how/why it was rubbing and what needed to be done to correct it. While looking for a way to adjust the brake without loosing the cable, I accidentally popped free the tension wire on the left side from the peg bracing it. As I put it back, I wondered if it was that simple on the right side. Sure enough. There was the tension wire swinging loose. Fastening it behind it’s peg mostly fixed that, but I discovered a screw to further adjust the tension and turned it a few times. It actually took me longer to put away the tools and put the jacket back on then to fix it. I will also add that Loke’s impatient sighs were music to my ears. He wanted to GO! Rolling onward, the day brightened as the cloud cover changed from a pewter gray, featureless sheet to clumps of shaded silver and white before finally pulling apart to reveal fleeting glimpses of blue. 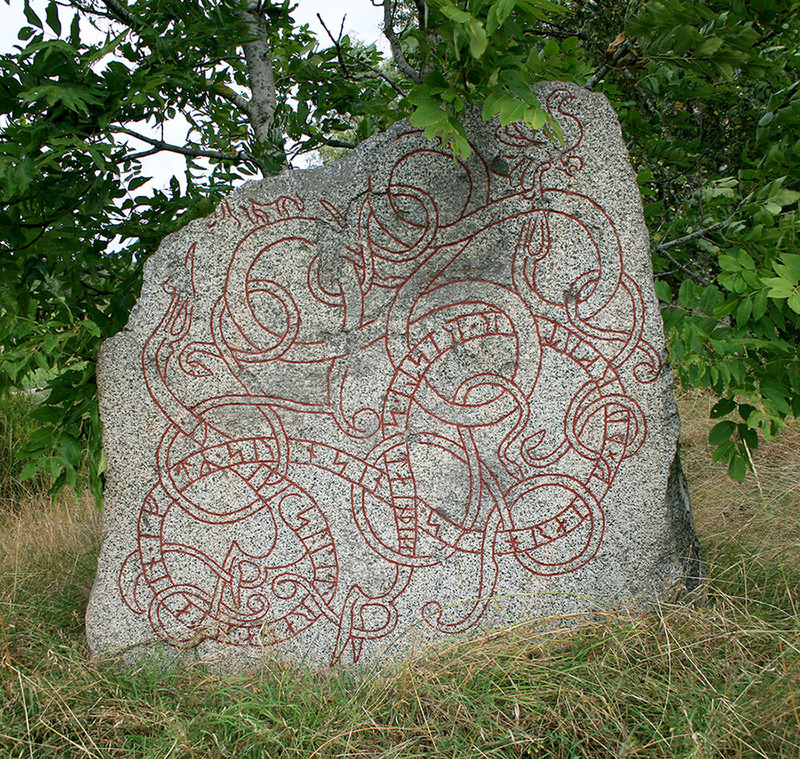 Near mile 4, I swerved over to stop again, this time for a surprise runestone. There were many sighs from Loke, letting me know what he thought about all these stops for photos and repair. As I walked through the matted grass between the road and the stone, I spotted about half a dozen large snails. It made me laugh. Imagine! Snails in their natural environment! It was a change from swerving around them on roads or cycle paths. I’d saved a few from a grisly fate of crushed by car, slowing enough to scoop them up and toss gently to the grass in the direction they’d been creeping. Uppland Runestone #746 is in good condition for it’s 1000 or so years of age. No lichen or moss and only a touch of weathering along the edge where maybe a 4 footed creature had worn away. Not much info on it though at least there was a rune translation on the placard. Going back to the trike, I bored Loke to pieces with a short rest. He clearly didn’t appreciate that it was for his sake as we weren’t even 1/3 of the way through the ride. My ‘mini-meal’ alarm went off, but I’d forgotten food. The plan had been to pack some almonds and grapes, but they’d been forgotten in the rush out the door. Loke wouldn’t do more than sit for a minute or two at a time. Particularly after we heard the thud of hooves and jingle of harness. Two sulkies went gliding by on what seemed to be a track hidden by the tall weeds. I think Loke wanted to race with them. Goof. During the 15 minute break, the weather couldn’t quite make up its mind what it was going to do. The sun looked like was going to emerge, but then the clouds moved back in. Perversity because I was thinking about using my tripod mayhap. Can’t make up its mind. Rain or Clearing? I almost wonder if I could travel around, breaking droughts simply by showing up and start setting my tripod. I exaggerate, but it does seem to summon rain. Loke actually did a happy spin when he sensed I was getting ready to move out. Upon putting away his water dish, I found him standing right next to his running bar where I could easily hitch him, his tail wagged in anticipation. Within a quarter mile of the sulky training track, the geese began. At first it was a sizable flock of about 40 in a field to our left. About 75 yards away, the nearest ones spooked and took wing. Within another 20 yards, the rest of them followed. Only then I spotted the ones on the right. A small cluster of 10 jumped away. Then another group further out. Abruptly, a huge flock that must have been nearly 200 hundred strong seemed to ripple out of the distant stumps of wheat. Honking in alarm, they stayed below the canopy of the distant trees as they streamed across the road after the other smaller flocks. It wasn’t just geese. A tiny group of 4 cranes made a distinctive contrast of size and shape as they tagged along. All of it happened too far away for the standard lens and too quick to make the change to the long one. Those were the only geese. It was like the initial flood out of a dam. Others flew overhead in their traditional ‘V’ formation. I could hear others honking in the distance along with occasional cries of more cranes. Definite signs that autumn is coming. There have been other indications for a couple weeks now at least. Waking a few mornings to temperatures in the mid-40’s. Hints of colors other than green in the trees. A few yellow leaves here. A faint blush of red tinging others. Hard to tell how much vibrancy we’ll get this year. At times, it almost seems as if the leaves are flinging themselves from the branches as soon as they begin to turn. Pity. I do so love autumn colors when they come strong and linger a few weeks. I still love this time of the year even if the leaves don’t blaze. The cooler temps invigorate me. My careful monitoring of Loke’s strength and enthusiasm continued. He didn’t seem to be flagging at all. He still wanted to move into a 10-12 mph lope from time to time, showed impatience when I stopped. All encouraging signs. As I came up to the the turn west which would be the worst stretch of the ride, I paused to peruse my maps. Only then did I realize how close we were to a ‘slott’ which is the Swedish word for castle or manor house. What a nice addition to the ride. It was then the clouds finally began to break apart in earnest and like the choral voices of angels from on-high, sun struck the earth. Part of me would have liked for the clouds to linger on. Wearing the jacket was no bother and the chill, brisk temps thanks to the lack of sun were vastly more comfortable for Loke. Biggest wood anthill I’ve ever seen. We scooted over the wide road to a smaller tree shaded lane and immediately turned onto an unpaved drive toward Ekoslund’s Manor. Loke perked up at the site of the gravel surface, still damp from the morning’s rain and flanked with trees close to either side. He wanted to race down it. He actually woofed at me when I stopped to goggle at what had to be largest hill built by wood ants I’ve ever seen. Easily over 3 feet tall though less than 5 feet in diameter. I guess I’m impressed by small things at times, but it was photo worthy to me and worthwhile for me to mention here. As we followed the lane with it’s brief curves and even a bit of a hill, I had a heart racing moment. I heard the car racing toward us. That gave me just enough time to swerve sharply right, giving Loke a rude shove to get us off the road as much and as quickly as possible. It crested the hill and the driver braked suddenly, probably stunned to find us there. He waved apologetically as he rolled by at a more reasonable speed. The splash of water preceded the first view of Ekoslund’s Manor. It was a small fountain, bronze I think, with swan statues in the pool around the three tier high basin column. There were perfectly clipped hedges and the lawn was lush, green without any browning or bald spots, flowers in neat beds. The grass beneath the trees was clear of any leaves or twigs. Each of them had neat little signs to label them. At least half a dozen of them were two or three different sorts of cherries. The closer I came to the buildings, the more worn and weathered they appeared. In spite of the very faded paint on the right hand one, the small curved buildings looked the best kept with flowers in the windows. They almost seemed divided into small rooms entered through wooden doors. Each door had a number on it as well as a charming little bell with a dangling rope to clang the clapper. Certainly more interesting than an electronic doorbell or a standard knocker. The northern large building of the manor complex seemed the worst off of the four. Broken windows, the paint-faded plaster cracking and breaking off the brick beneath. I peeked in through the windows and was stunned. It look like a hoarder’s nest. Broken furniture, wire shelving, electric wires and cables, boxes full of who knows what. A stuffed hooded crow, tattered and dusty sat on one sill as if looking longingly for escape from the mess. Most perplexing was a modern surgery light that wouldn’t look out of place in a medical scene in a new movie. That makes more sense now since the manor did serve as a cardiovascular center for a time. Apparently, the southern structure is used as a residence, but from a distance some of its rooms looked as cluttered as the more dilapidated one. It was also used as the recording location for the Swedish version of ‘Biggest Loser’ in 2005. I quickly finished with my explorations, keeping my distance from the buildings that looked potentially inhabited. During that wander, I finally pulled the jacket off as the temperature climbed with the sun finally out. Loke was quite happy to go briskly back the way we came, but his interest flagged quite a bit when we reached the main road. The traffic was heavy, but blessfully, there was a very wide and accommodating shoulder. Less blessfully, the winds had kicked up more and came furiously right down the big road into our faces. It was like pushing up a very long 4-5% grade climb. Not particularly hard for a short distance, but as it went on and on, it got worse and worse. Then of course a few real hills jumped in on the fun. We hadn’t gone far down the long road when I saw the top of a church’s tower above the tree crowns. I hadn’t marked or see a church there on my maps. Perhaps I’d already stopped at it some time in the past? I decided to ride to it rather than risk it. We made the turn which put the wind to our side and went on a bit faster. Loke seemed relieved to be on the smaller road and helped up the hill toward the church. Almost a dozen cars were in the church’s parking lot, so I was hopeful of a bathroom break in a building which held the toilet and what appeared to be a small kitchen for church activities. Alas, it was locked. Muttering about having been so cruelly teased, I set off to explore Husby-Sjutolft Church. It’s a fairly common looking church, but pretty. The inside is apparently quite lovely, but sadly locked so I couldn’t see for myself. I’ve no clue if there are any runestones hiding within in the porch or the church floor. I didn’t even look for stones along the route before I left. I was just out for a ride rather than hunting for history. Loke was less impatient as we took a rest for about 15 minutes in the parking lot. We’d covered about 10 miles, roughly half of what I’d mapped. At a guess, I thought the little detour to and from the unexpected church added about a mile. I toyed with calling Jens, but Loke still had energy enough to bug me. Less impatient doesn’t mean he was a rug on the ground. Reluctantly, I returned us to the bigger road and it’s unhindered wind with about 2 miles more to the northward leg of the loop. Often when I map areas, I don’t realize exactly where the marks on the map relate to the real world. So, when I saw Litslena Church just off a big round-about I recognized, my mind went ‘Ooooh, I’ll be riding part of THAT loop’. The major slip-n-slide ride of December 31st, 2012. At least this time we wouldn’t be dealing with rock hard ice glossed with rainwater. The 3 miles of that previous loop looked completely different with sunlight, deciduous trees with leaves and other green plants while heading north instead of south. Loke wanted more water and more frequently. Without the jacket and the sun out, it felt just perfect for me pedaling around. Naturally, that meant it was a bit warmer for Loke. His husky grin started to look more and more like panting. I even wet down his ears a few times, not because it was necessary, but in hopes of making him more comfortable. Warm or not and with 15 miles under his paws, Loke still had plenty of verve. He ticked along like a well tuned machine and had plenty of interest in his surroundings. It was glorious! This was the husky I’ve been missing. My fun companion and my cycle partner. I had a choice at the next intersection. I could have turned almost due west, adding as much as 2 miles or north which was the mapped way. The western way was the continuation of the good dirt road. North was… ugly. Big rocks studding sand made a bit mushy by the rain we’d had earlier in the morning. Admittedly, I had an argument with myself. Finally, in Loke’s interest we went north. Loke was wearing socks so the surface wouldn’t impact him too much and it felt more sensible to keep the distance as short as possible even if I could call Jens to get the furball. He was still going strong, but no sense in adding to the trip just because I was being a wimp. Loke was quite helpful as we went along. He didn’t pull hard, but every little bit helps on that sort of ground. The track worsened a bit and I had to swerve wildly to avoid big stones (head-sized and a little larger) thrusting up from the dirt. After most of a mile of that, it changed again, becoming loose packed soil beneath a fine carpet of fallen pine-needles. As soon as Loke saw that, it was as if we were just starting the ride instead of nearing the end. His tail was raised high and nose busy as he wanted to run. I relented, spinning us up to about 10 mph as I swerved to avoid the mud puddles so his socks wouldn’t fall apart. He just adores that kind of running surface, especially if it’s surrounded by trees! He tried his best to pull us faster, but after I told him ‘Easy’ a few times, he settled into the easy lope I permitted. We rejoined the paved road and soon were rolling past Fröslunda Church, familiar from a ride several years ago as well as earlier this year. After a slow climb up a hill, Loke got to lope a little more as it felt mostly downhill to Örsundsbro. The wind, finally at our backs helped. We didn’t go far into Örsundsbro, but made the final turn back to our starting place, about only 2 miles away. Jens called about then to ask if things were going okay. I told him how far we were from stopping, adding he could probably leave about 10 minutes later to arrive. The distance went quickly. Even with 20-21 miles, Loke still went smoothly and strongly. As we went down the gravel drive toward the parking lot, an older (70-80 years old) man stepped well back from the road edge. Then he waved a greeting and I stopped to say hello. He asked about the trike and Loke. Noticing that Loke was quite warm, he mentioned that the water in his house came from a spring high on the hill, no additives and pure. Would Loke and I like some? After sipping warmish water from a plastic bag, I wasn’t about to turn that down. He walked slowly between a mowed path in hedges. Hidden among black and red current berry bushes in an apple orchard was a darling yellow and white house. His wife was sitting on the steps, enjoying the sun. The man said he’d offered us water so she went inside to return with a big metal bowl for Loke. They were a wonderful couple. The woman had to move slowly. When I finally saw her hands, I winced at how painful it must have been to carry the bowl. They were swollen and painful. She kept apologizing for their orchard/yard. I rather liked it even overgrown as it was, but she was clearly unhappy with it but unable to do much with it. The man suddenly asked if I’d like some apples from their trees. Again, I wasn’t about to refuse! Fresh picked apples? Of course! He’d just finished picking about 5 lbs of them when Jens called to say he was at the church. I said my farewells to charming pair who told me I was welcome any time. It was the perfect ending to what had turned into such a wonderful day. Though the morning had been wet when we left the apartment, it had turned glorious and sunny. Loke had still been bouncing around the apple orchard and wallowing in the grass, obviously not worn out in spite of 22.19 miles. I’d had a great time with the cycle partner I’ve been missing so.